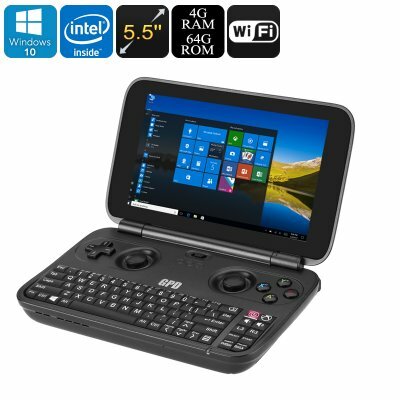 Successfully Added GPD Windows 10 Mini Laptop - 5.5-Inch Display, Cherry Trail Z8750 CPU, Mini HDMI, Intel HD Graphic, 4GB RAM, Dual-Band WiFi to your Shopping Cart. The GPD WIN GamePad is the ultimate 5.5 Inch mini laptop for all gaming lovers out there. Offering PC gaming on the go, this tiny Windows 10 Laptop truly enhances your mobile entertainment experience and lets you enjoy games, movies, and more like never before. Although featuring the looks of a regular gamepad with its D-Pad, joysticks, A, B, X, Y, L1, L2, R1, and R2 buttons – this miniature laptop actually runs on a Windows 10 OS and holds a sophisticated CPU and graphics unit. Additionally, it also packs a full QWERTY style keyboard, allowing you to write up texts and browse the web through its WiFi connectivity. Packing the Intel Cherry Trail Z8750 CPU and 4G RAM, this mini gaming laptop lets you enjoy regular PC games anywhere you go. Built to deliver a speedy and powerful performance, this Quad-Core CPU is guaranteed to meet all your media demands. Along with its cherry Trail processor, this mini windows 10 laptop furthermore holds an Intel HD Graphic’s unit thanks to which it provides you with stunning visuals, vivid color, and detailed graphics while playing the most demanding of PC games. With 64GB of internal memory and a 128GB SD card slot, the GPD WIN GamePad holds plenty of space for you to store your favorite games, movies, and files. Packing a beautiful 5.5-Inch IPS display, this mini laptop allows you to enjoy games and media in stunning HD resolution. Additionally, it supports a mini-HDMI output, providing you with the possibility to hook up your mini laptop to your large screen TV. Its Windows 10 operating system offers access to all the trusted Windows features and programs, letting you write up files, browse the web, and use all your regular PC programs on the go. Packing a powerful 6000mAh battery, the GPD WIN GamePad provides up to 6 hours of continuous usage time – enough to get through a media filled day without needing to worry about battery life.